I have always loved the Hill Building and once planed to make it into a law firm, owned by none other than me! Could be wrong but i am pretty sure that on the way to work this morning i saw them beginning to take apart the suntrust sign and black box on top. Any idea what the plan is for the top of this landmark? Yes! It is being removed and restored to its former glory! The building looks naked on top, and needs something stylish on top. I suggest looking on face book @ growing up in Durham and seeing what I suggest. A very stylish "topper" like on the Chrysler building on even something very contemporary like on the bank of America building in Charlotte nc. I would love to talk to the developer! can't believe they took the top of this building. it just looks so strange and naked without it. i agree with ryan -- put something, anything on it! 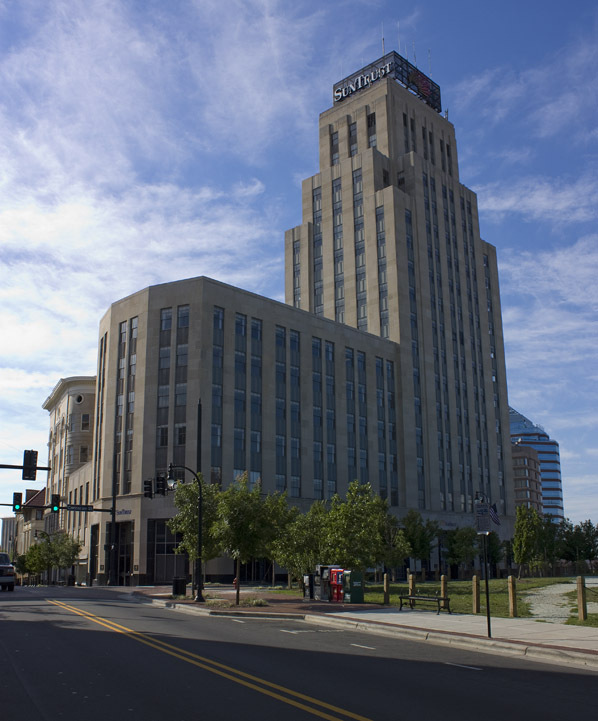 The Hill Building, also known as the CCB building and the Suntrust Building, is certainly the most prominent piece of historic architecture in Durham. Although old enough and iconic enough to be historic, several structures predate the building on this important site in downtown Durham. 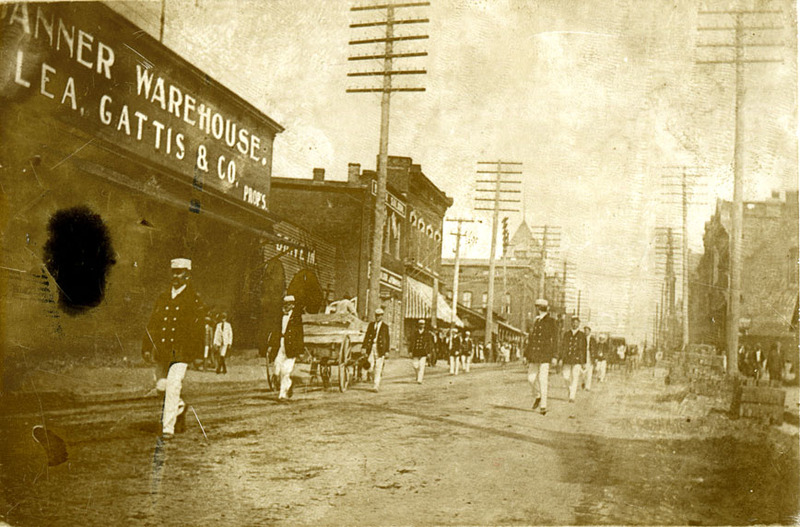 The northwest corner of Main and Corcoran was used for warehouse space early on, according to Gray's 1881 map of Durham, including the Banner Warehouse, with its "Drive-In"
By 1906, the city had grown substantially, and the U.S. government constructed a substantial post office on the eastern portion of the above site. From the northeast corner of Main and Corcoran, looking west-northwest. 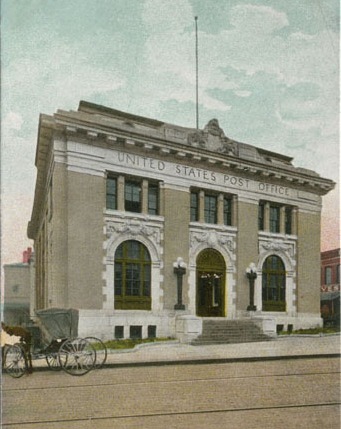 The Trust Building (still standing) is directly to the west of the post office. The first Municipal Building and Academy of Music is to the north. This view dates from between 1906 and 1909. 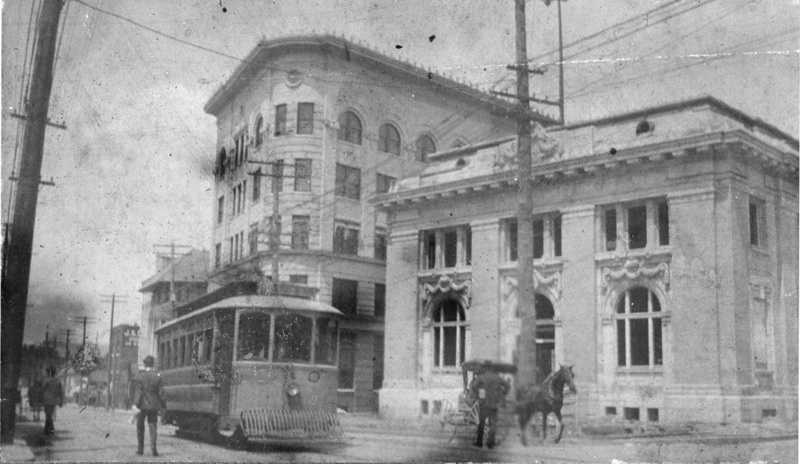 This view is taken from the First National Bank building on the southeast corner of Main and Corcoran. Moving generally from right-to-left, you can see the Geer Building, the Washington Duke building, the old post office, The Trust Building, and the Temple building (to the west of the Trust building). Only the Trust building and the Temple building are still standing. This photo dates from the late 1920s or very early 1930s. In the early 1930s (completed in 1934) the U.S. government built a new post office on the corner of Chapel Hill St. and Rigsbee Ave. 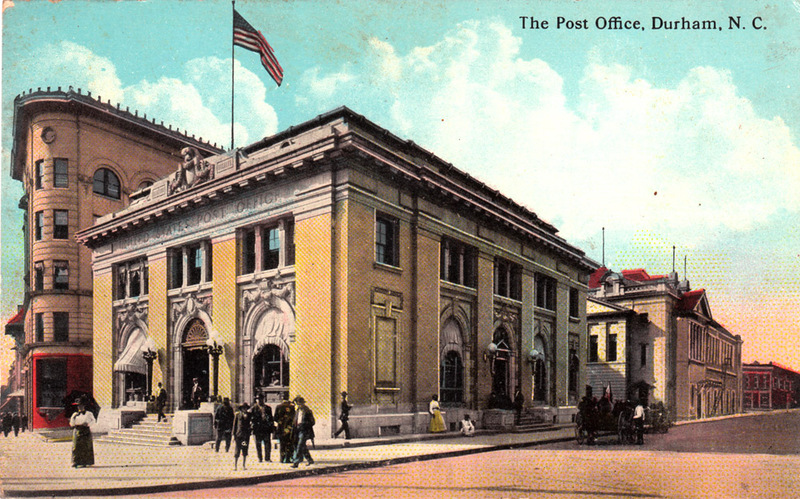 The old post office was shut down and demolished. Construction of the Hill Building was begun on the site of the former post office in 1936. George W. Kane was the contractor, and Shreve, Lamb, and Harmon (who previously designed the Empire State Building and Winston-Salem's RJ Reynolds Building) were the architects. The Hill Building from a distance, from Blackwell St., under construction ~ Dec. 1936. 1937 - no month given. In 1962, Thalheimer's-Ellis-Stone moved across the street to a newly constructed building on the southwest corner of Corcoran and West Main Sts. CCB remained the primary tenant until 2005, when the switchover from the merger of Suntrust and CCB was complete, and the logo on top of the building was changed. In 2007, Greenfire purchased this building and announced plans to convert the structure to a boutique hotel. Plans languished, but seemed to perk up again in 2010 when Greenfire received approval to use NC Industrial bonds to develop the hotel, and had a city incentives package improved (based on the synthetic TIF model) to develop the project in September 2010. This ultimately did not come to fruition, but in 2012, Greenfire sold the property to 21c Hotels, which planned to develop the property as the long-intended boutique hotel. In November of 2013, 21c began removing the signage from the top of the building. 05.2016 Hill Building with adjoining building removed and foundation work on new skyscraper begun.